I have a sweet and simple birthday card to share with you today. It features the newly released Make a Wish stamp set and Die-namics and the Essential Cover-Up Vertical Die-namics. I stamped the candles in Blu Raspberry, Daffodil, Grape Jelly, Lemon Drop, and Limelight Premium Dye Ink. To make them shimmer I added a touch of Orange Fizz Ink and Wink of Stella to the flames. 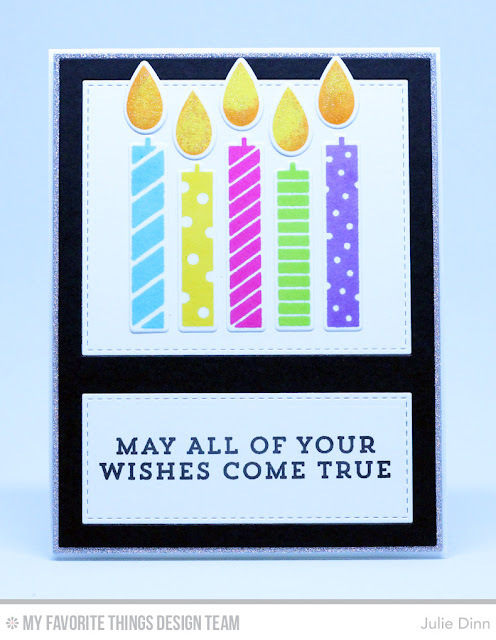 The sentiment is one of the many fabulous greetings in the Make a Wish stamp set. Thanks so much for joining me today, be sure to check out the MFT Blog to see all the gorgeous creations the rest of the team has to share with you.